Fresh hop beers have exploded in Portland the last few years, and they are also catching on more and more in our sister city of Seattle. This past Saturday, Geoff Kaiser of Seattle Beer News (he's also a regular columnist at NW Brewing News) curated 15 fresh hop beers for a mini-festival at The Noble Fir, a relatively new tavern in the Ballard neighborhood. The place quickly filled up, and had a line running down the block. 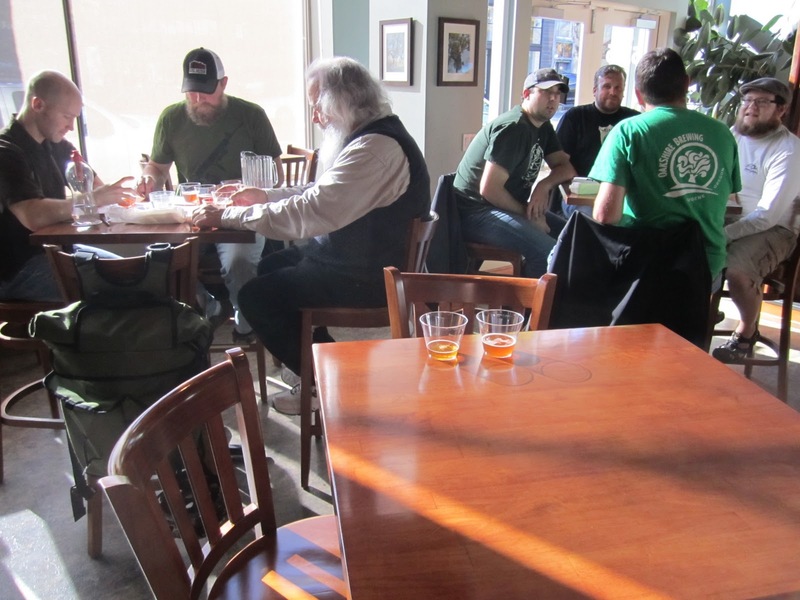 There were eight beers from Washington and seven beers from Oregon, so before the doors opened about a dozen beer mavens from the two states took part in a blind tasting to choose the best of the lot -- and to decide which state turned out the best fresh hop beers. Fourth place was taken by a Washington beer: Two Beers Fresh Hop Ale. I wasn't involved in the final best-of-show judging, so of the four finalists, I only scored Double Mountain and Two Beers. If it's any consolation to fans of Washington beer, I preferred the Two Beers to the Killer Red, though both were excellent. 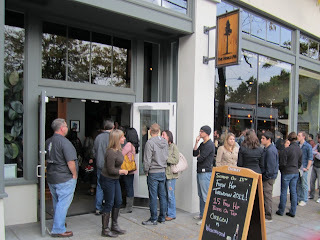 Afterward I did have my first taste of the Laurelwood Cavalry. I had been hearing good things about it from people who had already tried it in Portland, and it was indeed a top-tier fresh-hopper. On that list, I judged the six from Oakshire down to Seven Seas, and that's the order in which I had them scored (after Two Beers and Double Mountain). I foolishly left the bar before the festival opened for real and was then stuck outside because of the crowd, so sadly I missed trying the last three Washington beers. Still, it was a great experience, and I am grateful to Geoff for inviting me to take part. Further reading: Geoff's official report on the Throwdown. If you're not familiar with the Noble Fir, it's a nice place that's worth a visit if you're in the neighborhood. Fifteen beer taps, plus two nitro taps, and a pretty good selection of bottles; no kids allowed. The food menu consists of small plates, including vegan options: you can pick an assortment of 3, 5, or 7 items for $10, $15, or $20 respectively (if I remember right), which seems pretty reasonable. It's not reflected in the name, but there is a travel theme to the restaurant: one wall is lined with travel books and laminated maps for your reading pleasure while you're having a beer or some snacks. Oh yes, I'd love to try it! One of the best fresh hop beers I've had this season is a homebrewed Kolsch by a friend of mine. You sir are a fresh hop king.. and I am envious of your trip up there. Fresh hop beers are among my most favored of all.. and I am thankful to be in the best place in the world for fresh hop beers. Nice write-up, and I like their scoring method. I found that many didn't truly showcase the 'fresh-hop' qualities I look for in the season.